They came in one after another. Jin was dialed in on the depth, retrieve and possibly also had the right fly in the right size tied in the right color because he was hauling in shad after shad to the boat for the past half hour. We were anchored outside Fletcher’s Cove on the Potomac River in Washington, D.C., on an absolutely beautiful Sunday morning. 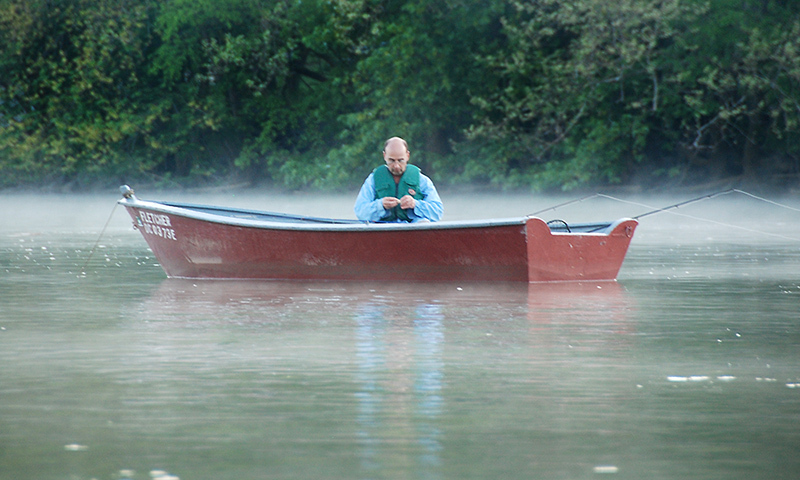 I arrived early to claim a boat, but the usual rush of anglers did not appear until well past 6am. 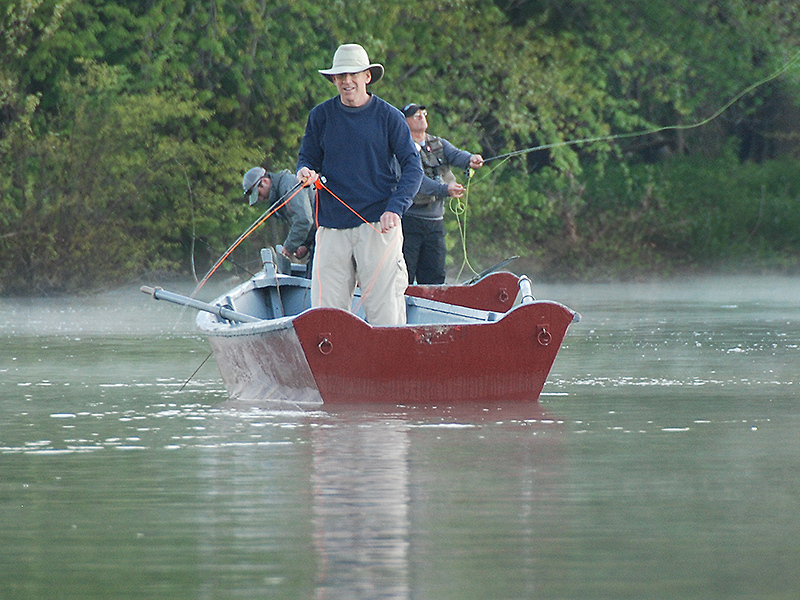 By that time Jin and I were anchored and fly fishing for shad just outside the bubble line of the main current. The morning action was good, but not great. 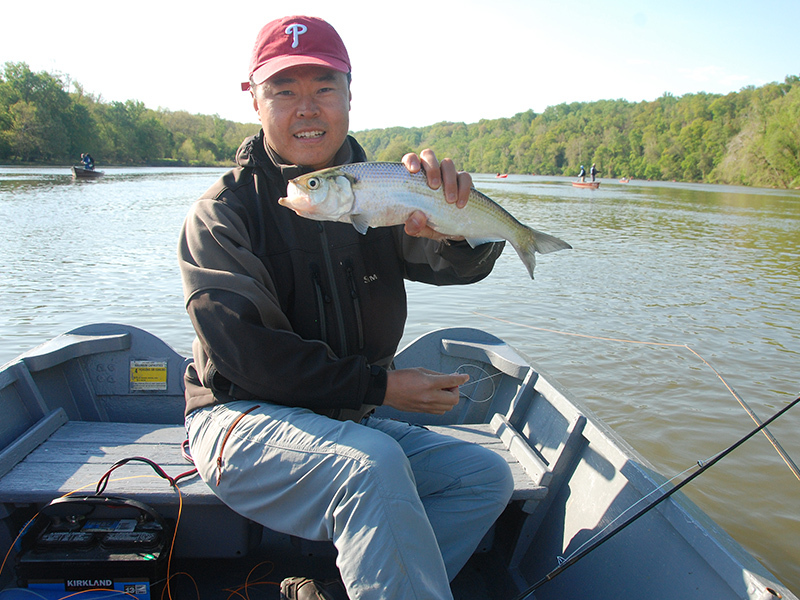 Jin caught Hickory shad at a fairly steady pace but I was pulling in a ton of herring. I think I caught more herring in a half hour than I’ve ever caught in all the years I’ve been fishing outside Fletcher’s Cove. 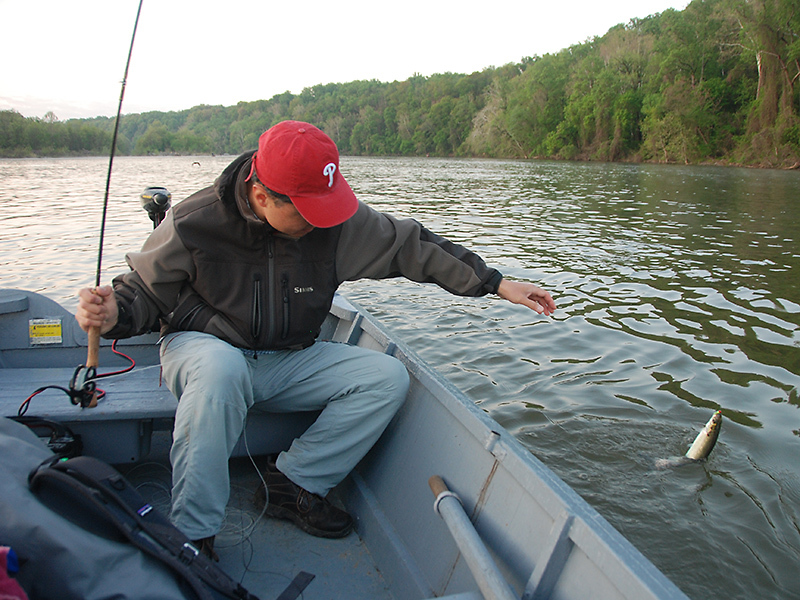 When I got the herring problem figured out we both caught a good number of shad, all Hickories, in spurts--a couple here and there then a 10 or 15 minute interval of no action until we caught a couple more. It was just enough that it kept you from getting antsy and moving to another spot. The current was also approaching peak and usually the bite tapered off at this point, resuming when the water began moving in the opposite direction. The tide eventually turned and the bite began to pick up. Jin was hooking them about 20 feet behind the boat after giving his line a good soak while I was getting most of my bites as the fly was coming up through the water column close to the stern. The fish were so close to our boat that I hooked a few by just dangling the leader and a short section of sink-tip in the water and giving it a slight twitch. When there was a break in the biting we hauled in our lines and took a quick hot dog and soda break at the Fletcher’s Boathouse concession before heading back out for more fishing. Jin suggested we anchor further up river from our original location since the shad seemed to be right under our boat. It turned out to be the right decision. Jin started fishing deep and I began to fish shallow, slowly increasing the depth after five or six casts so we could find out where the shad were holding in the water column. After 20 minutes I had a bite. Fishing the same location and depth yielded another Hickory. Calculating the grain weight of the line and the seconds it took to sink gave us the critical depth. The party was on. Jin was dialed in on his spot and was hauling them in on just about every cast. Hickory after hickory came to the boat. I wasn’t doing too bad either, I got my share of Hickories and a couple of American shad, and we doubled up multiple times. Jin caught so many fish that at one point he was going to call it a day and quit fishing but I told him he’d better get them while the fishing was hot so he buckled down and continued to pull in shad. It was ridiculous. Jin’s fly was being chewed to pieces and chunks were hanging off, which he just tucked back in under the cone head and continued to fish. Finally he had enough and after landing one more Hickory he snipped the fly off and reeled up his line. He said his arm and shoulder were just too sore to continue fishing. I stayed with it and caught a couple more but I was getting pretty beat too so after landing one more shad I called it a successful day and put the rod away. We must have put on quite a show because as soon as we started hauling up our rock to head back to the dock another boat called out to us to claim the spot. 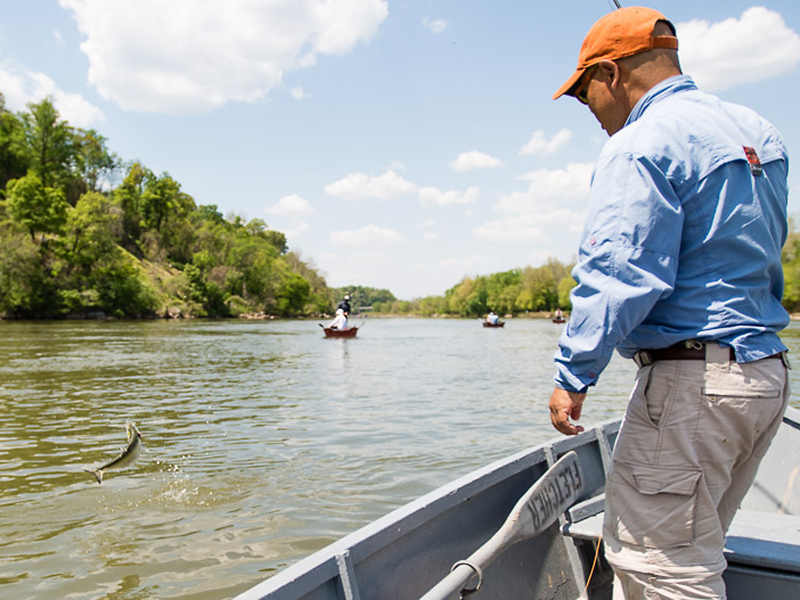 EQUIPMENT: We used Sage XP 7 and 8 weight rods, sinking lines and a variety of shad flies in a wide selection of colors.